...to the Home Page of the Texas Gun Collectors Association (TGCA) one of the oldest gun collecting clubs in the country whose members' interests mostly revolve around antique and historic firearms from a bygone era and also collectible classic firearms from more modern times. 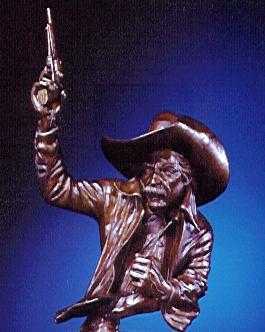 The spirit of Texas may be seen in the bronze sculpture titled, "Stampede" by Covelle Jones, Texas, pictured here, and one may feel the raw emotions of the cowboys experiencing the potentially disastrous stampedes occurring on those cattle drives of a hundred years and more ago from Texas to Kansas. And from which one may sense the freedom of the wide open Wild West of an age of legend now swiftly passing into America's history and mythology. The guns and other tools of the cowboy's trade form the basis of many a TGCA member's collection, as do the weapons and memorabilia of the American Civil War, and other major events in American, and even world, history. Other members may base their collections on the guns of a particular gun maker - Colt, Remington, Smith & Wesson, Winchester, or one of myriad other makers. Others will collect variations of just one type of gun such as Colt single actions, derringers or Winchester .22 rifles. The list is endless. We extend a warm Texas welcome to the visitor - member or casual visitor - and the visitor is cordially invited to explore this website to learn more about TGCA and what it has to offer. Within these pages you will find a few articles from past editions of The Texas Gun Collector (see here), the fabulous Parade of Walkers 2003 and 2008's exhibit Gathering of Patersons. Within these pages you will find information about our magazine The Texas Gun Collector, the much acclaimed Parade Of Walkers 2003, and other activities of the association. Interested non-members are cordially invited to apply for membership. An application form can be printed here or found at the Members tab, under Annual Membership. For those wishing to reserve a trade table or display table on which to sell or show articles or items from their collection, the Space Reservation Form (i.e. table reservations) for our next meeting and show can be found at the Show tab.